NHY 947 is an ECW ‘Queen Mary’ coach body with the sort of chassis one might expect underneath – not the AEC Regal rebuild in Tilling livery submitted a while ago! 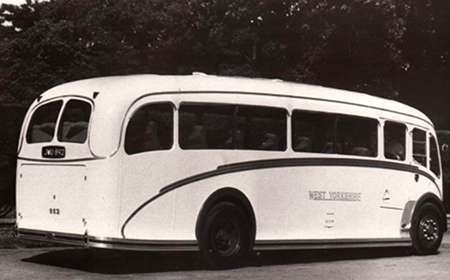 This Bristol LWL6B was new in 1951, with ECW FC35F body. We see it on Southampton Common on the sunny morning of 7 May 1979, while taking part in the Southampton City Transport Centenary rally. The only batch of these bodies sold to a Scottish operator were on Daimler chassis. This photo of fellow LWL6B, NHY 946, No.2814, was taken in Railway Place, Bath in August 1958. The term "Queen Mary" has been applied in enthusiast circles to a number of psv types, notably the full fronted PD3s of Southdown, though in that latter instance the accuracy of the sobriquet is strongly disputed in some quarters. I always understood that the intended analogy was with the low loading military articulated lorries designed for the carriage of tanks and heavy plant rather than the Cunard liner, and was meant to suggest a certain degree of ponderousness in appearance and progress. This style of ECW body did suffer from rather heavy frontal treatment, but it compared quite favourably with the dreadful full fronted efforts of some other contemporary coachbuilders on front engined chassis. NHY 946 is pictured in this thread Bristol Tramways – Bristol L6B – NAE 3 – 2467 this time in the cream and maroon livery of 1963. Whilst there are plenty of Bristols on the site, I don’t think I’ve seen this one represented so far. This exposed-rad Bristol L6B was shot at the Bristol Waterfront Running Day in 2011. New to Bristol Tramways in 1950, so sixty-one years old in this picture and looking well! Nice view, Les! What I find especially interesting is the combination of the usual Tilling green and cream livery with the greyhound logo. In my experience, the logo was accompanied by a red and cream . 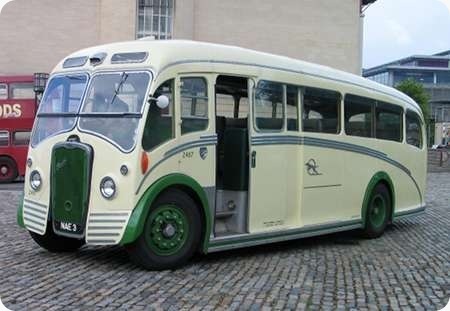 . .
Greyhound coaches were cream and green during my youth in Bristol. The first to appear in cream and red were some 1963/4 Bristol RELHs and the new livery was then applied to older coaches but, by then, the three L6Bs had been withdrawn. The superb ECW interiors of these vehicles were glorious. Whether in red or green "Tilling group" fleets the interior scheme was, I believe, light green with "marble effect" panelling. Flooring and ceiling linings were also green and the seating moquette delightful. I’ve had many a wonderful journey from Leeds to London on West Yorkshire ones – nine hours and three refreshment breaks, and every mile an acoustic and comfort joy. Somewhere I have a very poor box camera picture of such a vehicle during a break on one of my many trips. 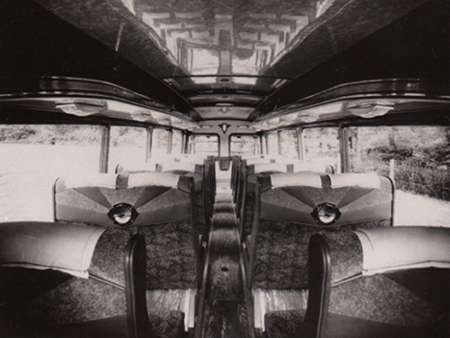 Further to Chris Youhill’s enthusing about these L6B coaches, particularly the West Yorkshire ones, I thought I would add a picture of the interior which he was describing. I think that the interior panelling colour was called eau de nil and even the lino flooring had a green marble effect colour. The interior shot and the rear view are from official ECW stock. I have also added the highly cropped photo because it was the first bus photo I ever took – very predictable! It’s a pity that the old box Brownie didn’t give a satisfactory end result. 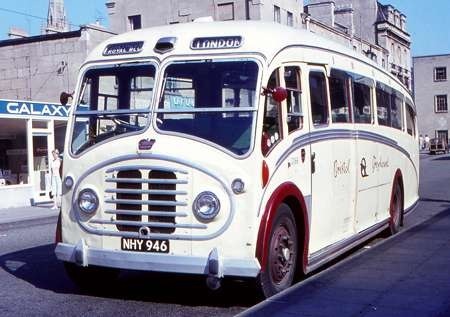 This would have been about 1960/61, when the L6Bs were painted with large areas of red as they were demoted. Brilliant photos, David R. At this stage, the vestiges of Art Deco were still around, notably, in this case, with the sunrise backs to the seat. 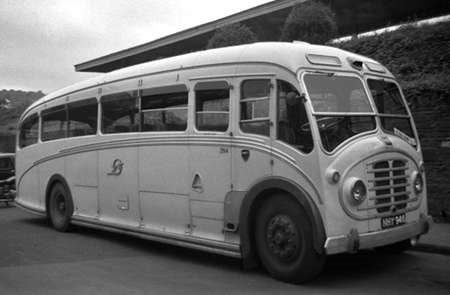 And those enormous side windows, something which I’d never seen before in a coach of this era. …..but like contemporary Plaxtons, Chris, they are divided in the middle by a bright metal strip. 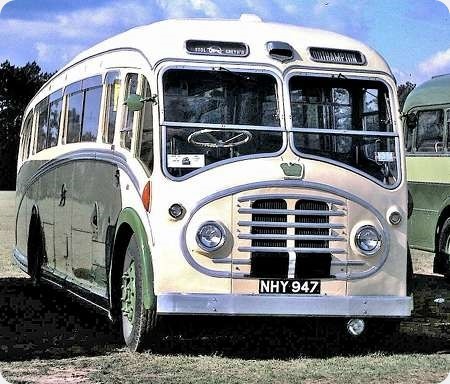 The ‘Hants & Dorset’ open-toppers used on the journeys to Poole & Sandbanks in the 1960s had the cream & green livery almost identical to the Bristol coach pictured. It looked nice when clean, but did not wear well in wet weather. There was a period during my time at school in Bristol (1953-9) when BT&CC / BOC coaches had black trim instead of green and then afterwards went to Maroon! 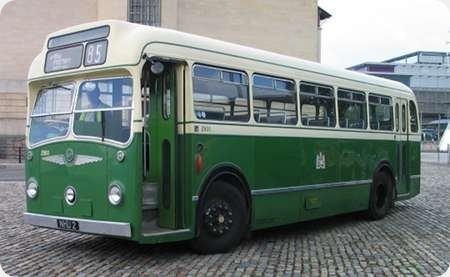 The Greyhound L6B coach was delivered with green trim, as were many of Bristol’s coaches, before having a brief flutter with black, then maroon and finally red. When new and in green the Greyhound in Wheel logo would NOT have been carried by NAE 3 (or NAE 1 and 2), but was by subsequent coaches. I have had it fitted to NAE 3 to confirm it’s previous identity – and I believe that it does not look out of place! I am surprised that MW says that NAE 1-3 did not have a metal Greyhound logo from new, but I cannot remember accurately back to those days! I imagine, with my experience of getting ECW to do anything out of the ordinary, that the logos would have been attached at Lawrence Hill upon delivery and pre-service inspection, together with fleet number transfers (later plates) – that was the way Tilling operators usually coped! I attach a photo of wider and longer LWL6B coach (NHY946 by then 2066) in maroon trim and the elegant Bristol Greyhound script at Bath bus station arrivals platform on September 15, 1963. I thought it looked very elegant and cosy in those days despite the body style being very dated compared to the current LS coaches already in service. My recollection agrees with Mike Walkers. My father a Bristolian who would have been around 20 when the Greyhound name disappeared would mention Greyhound occasionally. It was clearly regarded as a quality service compared to Tramways. In Bristol of the late 1950’s BT&CC were a monopoly as far as bus and express services were concerned. Excursions and tours were a different matter where there were a number of competing operators the main one being Wessex whose day or part day excursion program was probably three times the size of Tramways. My parents were regular Wessex customers and, as I wanted to try out one of the Bristol coaches, it took quite a bit of persuasion from a 7 or 8 year old to get them on to a BT&CC excursion – we went to Slimbridge I recall. Tramway’s coaches were the reverse of the bus livery; cream with green relief instead of green with cream relief. 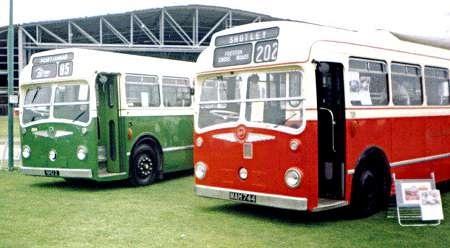 Around about 1960 or 1961, BOC as they then were, swapped the green in the coach livery for maroon and then a few years later for red. 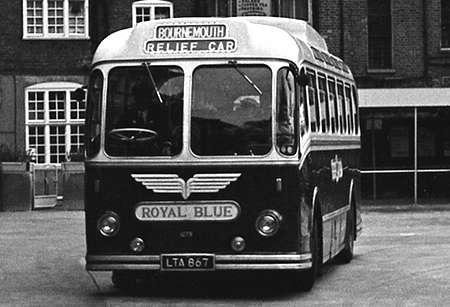 At the same time as the change in colour, the fleetname Bristol Greyhound and the motif were added. 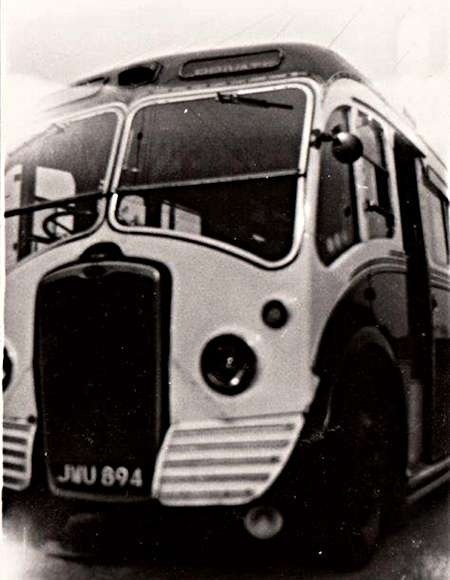 At the same time, or very close to it, the coach fleet, which had fleet numbers mixed indiscriminately with single deck buses, were renumbered in their series which made it much easier to remember which were coaches and which were buses. I am fairly sure that the idea of the colour change and resurrection of the Greyhound name was to create a distinction between Bristol’s coaches and the bus services.